Continental has developed a new air spring system with integral sensor technology that provides continuous operational status information in real time. Everyday operations in the construction and mining sectors will gain in efficiency as a result of the smart air spring: continuous condition monitoring offers operators of construction machinery valuable assistance in ensuring trouble-free and efficient operations. Continental’s system represents a fundamental contribution to the digitalization of air spring applications. Construction machines and equipment have to deliver peak performance in demanding environments. Their components also have to cope with dust, mud and dirt. Up until now, with a conventional air spring, users received almost no operational status information. They had to rely simply on what they could see from the outside or on their subjective perception. Changing that was one of the Continental engineers’ aims when working on the air spring with integral sensor technology. “This development is a milestone in air spring technology. We’re ushering in the next stage in digitalization. The air spring has been made smart, enabling it therefore to communicate with the user,” says Herwig Peters, who is responsible for industrial applications of air spring systems at Continental. 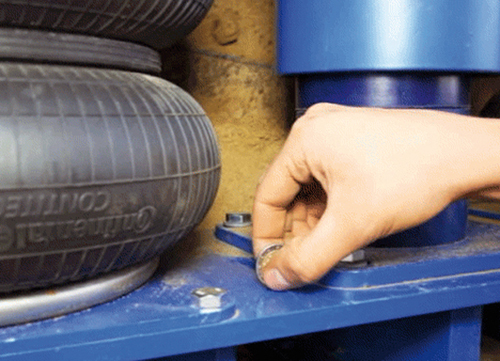 Everyday operations in industrial applications will gain in efficiency as a result of the smart air spring. The air spring can now supply precise and reliable information on its status, e.g. pressure, temperature and height. The air spring’s operating height can be displayed accurately and dependably. “The purpose of the integrated-sensor air spring system is to make a globally established system such as the air spring even safer, simpler and more efficient for customers – and thus also all the associated operations and processes, particularly in the fields of control and monitoring,” says Carsten Klages, sales manager for industrial applications at Air Spring Systems. But how do you manage to marry a rugged air spring, as used in construction machinery, with sophisticated electronics? “The greatest challenge in incorporating the sensor system really lay in integrating the fine wiring of the electronics in the product, such that the air spring properties are not changed and the electronic system is not damaged,” reports Mr. Klages. The Continental experts resolved this demanding brief by means of a specially developed adapter with 2 cables: one to connect the air spring control system and the other for the data connection. This ensures a reliable connection between the air spring and the sensor system. “This information is then transmitted to the machine controller. That is the necessary prerequisite for predictive maintenance or safety. As in the past, we will stay in close consultation with our customers while driving the development of such systems to ensure they are directly tailored to their needs,” says Carsten Klages.